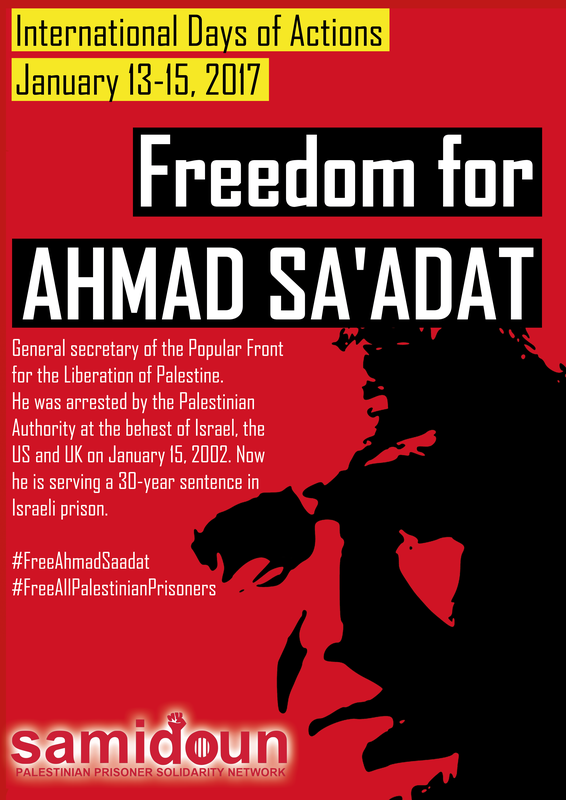 Activists around the world are gearing up for international days of action to free imprisoned Palestinian leader Ahmad Sa’adat and all Palestinian prisoners. Sa’adat was imprisoned in a Palestinian Authority jail in Jericho until March 2006, when the prison itself was attacked in a violent Israeli occupation military raid and Sa’adat and his comrades abducted. The call to action was endorsed by over 60 organizations around the world. A series of events and actions are being planned in occupied Palestine and in cities around the world, including New York, London, Manchester, Toulouse, Paris, Berlin, Milan, Padua, Florence, Brussels, Albuquerque, Hilton Head and Copenhagen, as well as events coming up in Canada, Ireland and elsewhere. Materials and resources for use are available for download. We invite your organizations, groups and coalition to endorse this call to action and participate in the events of January 13-15, 2017. Thank you! Please use the form or email samidoun@samidoun.net to sign on. Events are already being scheduled in cities around the world. Please share your event with us or email samidoun@samidoun.net. January 13-15, 2017 marks the 15th anniversary of the seizure of Palestinian political leader, General Secretary of the Popular Front for the Liberation of Palestine, Ahmad Sa’adat, by the Palestinian Authority under the policy of “security cooperation,” at the behest of Israel, the United States and the United Kingdom. 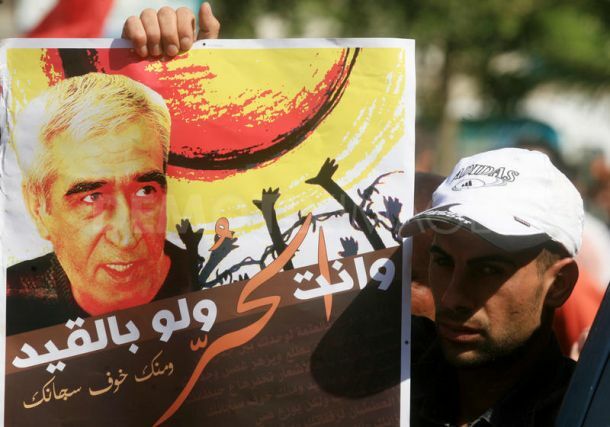 Today, after a 2006 attack on the Jericho prison by Israeli occupation forces, Sa’adat is serving a 30-year sentence in occupation prisons, convicted in a military court of leading a prohibited organization and incitement. Ahmad Sa’adat is a leader of the Palestinian prisoners’ movement and a leader of the Palestinian national liberation movement, held behind bars with 7,000 fellow leaders of the Palestinian people. There are thousands of Palestinian prisoners in Israeli jails, on the front line of the struggle for freedom. In the past year, over 6,000 Palestinians were arrested by Israeli occupation forces. These Palestinian political prisoners are the leaders of resistance to occupation, targeted for their role in refusing racism, colonialism, apartheid and occupation. The imprisonment of Ahmad Sa’adat and his fellow Palestinian political prisoners is aided and assisted by the complicity of international states and major corporations. The United States and United Kingdom guarded Sa’adat in a Palestinian Authority prison and cleared the way for an Israeli attack, ensuring Sa’adat and his comrades came under fire. And the political, military and economic support these and other states, including the European Union and Canada, provide to the Israeli occupation allows the continued imprisonment and extrajudicial execution of Palestinians with impunity. 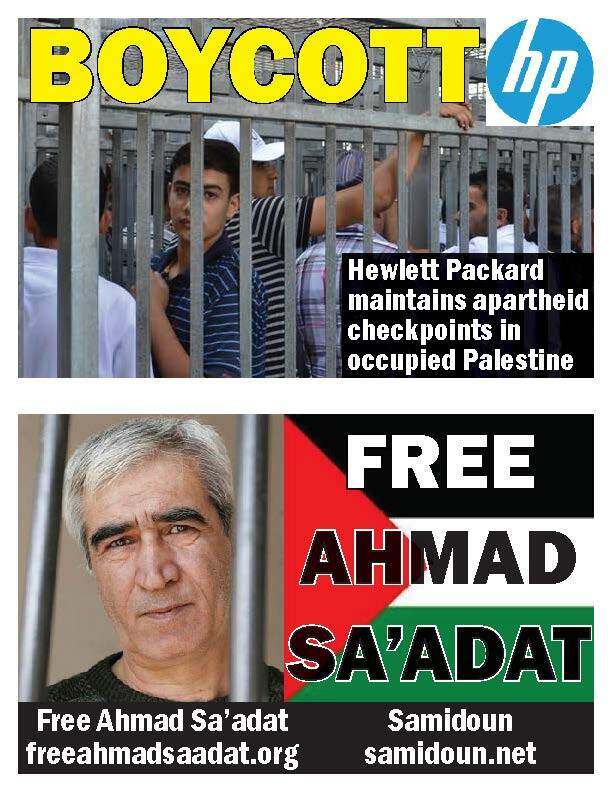 Further, corporations like Hewlett Packard (HP) profit from the imprisonment of Palestinians by selling their services to the Israeli Prison Service. 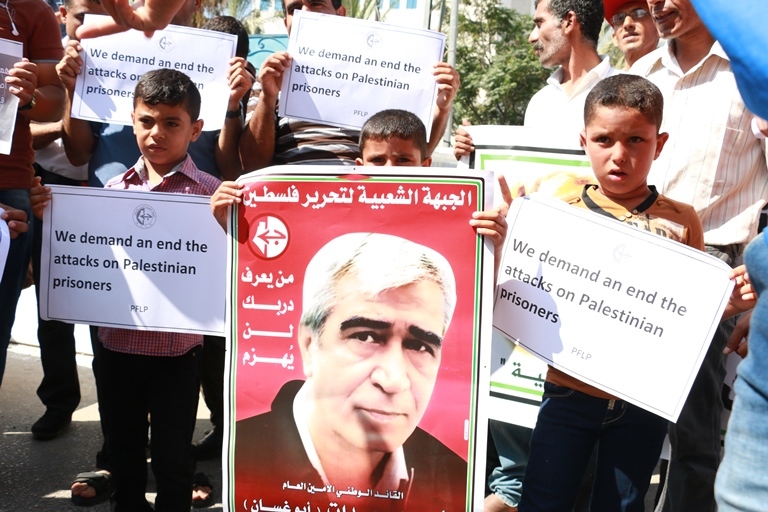 We echo the call to organize events, actions and protests in cities, town squares, campuses and public spaces to break the isolation of the prisoners, and demand freedom now for Ahmad Sa’adat and all Palestinian political prisoners. Berlin – Sunday, January 15. Palestinian Contingent in the Liebknecht-Luxemburg-Lenin March. 9:30 am, gather at U-Bahnhof Frankfurter Tor. Organized by the Democratic Palestine Committees-Berlin. MORE EVENTS TBA in Italy – Facebook: https://www.facebook.com/events/1739069739753137/, Ireland, and more. We urge you to organize events and please share your event with us or email samidoun@samidoun.net.